This description of the Book of Zechariah is from Easton's Bible Dictionary. Zechariah 1:1-8:23. It begins with a preface (Zechariah 1:1-6), which recalls the nation's past history, for the purpose of presenting a solemn warning to the present generation. Then follows a series of eight visions (Zechariah 1:7-6:8), succeeding one another in one night, which may be regarded as a symbolical history of Israel, intended to furnish consolation to the returned exiles and stir up hope in their minds. The symbolical action, the crowning of Joshua (Zechariah 6:9-15), describes how the kingdoms of the world become the kingdom of God's Christ. Chapters 7 and 8, delivered two years later, are an answer to the question whether the days of mourning for the destruction of the city should be any longer kept, and an encouraging address to the people, assuring them of God's presence and blessing. Zechariah 9:1-14:21. This second part of the book bears no date. It is probable that a considerable interval separates it from the first part. It consists of two burdens. The first burden (Zechariah 9-11) gives an outline of the course of God's providential dealings with his people down to the time of the Advent. The second burden (Zechariah 12-14) points out the glories that await Israel in "the latter day", the final conflict and triumph of God's kingdom. 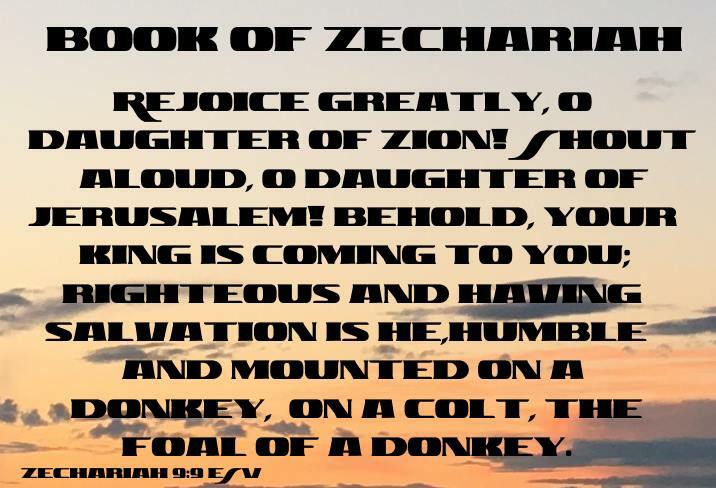 This description of the the Prophet Zechariah is from Easton's Bible Dictionary. Zechariah: Jehovah is renowned or remembered. A prophet of Judah, the eleventh of the twelve minor prophets. Like Ezekiel, he was of priestly extraction. He describes himself (Zechariah 1:1) as "the son of Berechiah." In Ezra 5:1 and 6:14 he is called "the son of Iddo," who was properly his grandfather. His prophetical career began in the second year of Darius (B.C. 520), about sixteen years after the return of the first company from exile. He was contemporary with Haggai (Ezra 5:1).